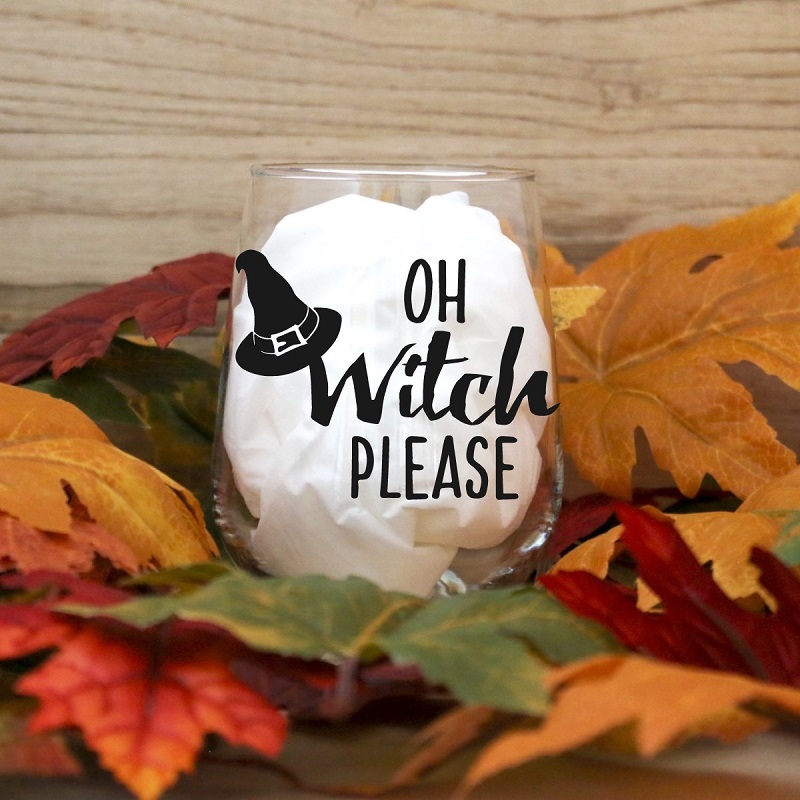 I got a bit of a head start on last week's Friday Finds, with some amazing fall-themed goodies, and this week is no different. Enjoy! 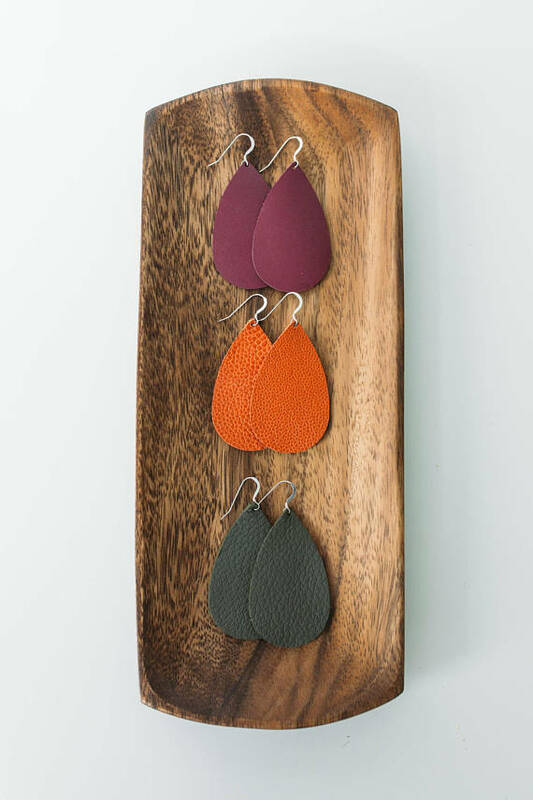 These leather statement earrings really caught my eye this week, not just because they're perfect for fall, but because they're light-weight. In fact the slogan for Leather B Shop is "You won't notice them, but everyone else will." I do love a great statement earring, but I can't stand whenever they're heavy and sway back and forth like crazy. 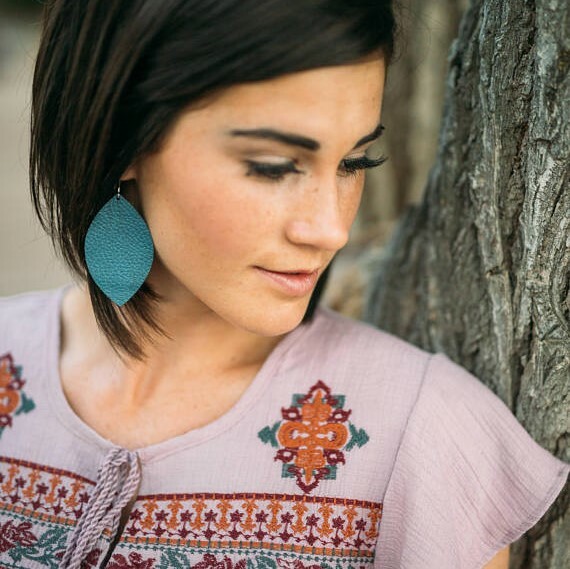 These leather earrings give the look of a big statement earring without all the weight. And they're cute! There are so many great fall colors and some prints as well, like leopard. Who doesn't love leopard for Fall? Check out Leather B and let me know which one is your favorite. They have a great sale going on right now. You can order 2 pairs of earrings for $34.00 with the coupon code LBCUSTOM. 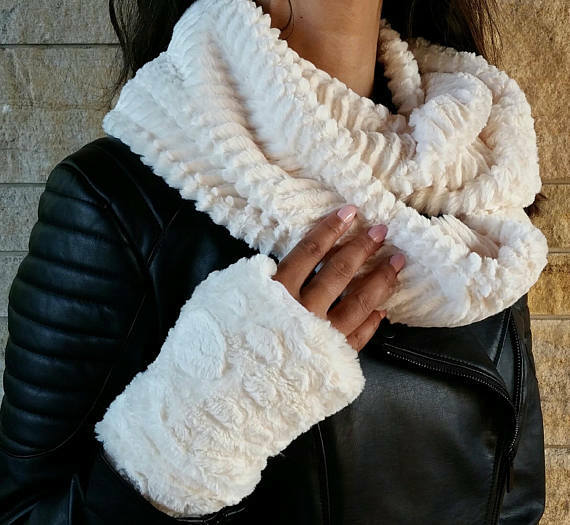 What is really cool about this shop is the matching faux fur mittens. These finger-less mittens are great for whenever you're using devices. Though I think they would also look so cute layered over slim gloves. It's time to update the home for Fall as well. One of my favorite ways is with small home accessories. 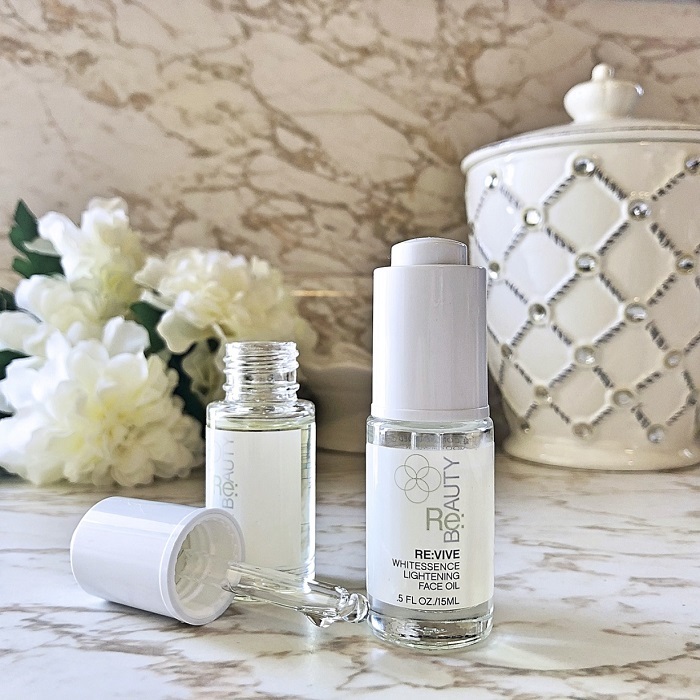 Pumpkins and fall flowers are always great, but I like a few long-lasting items that I can use year after year. 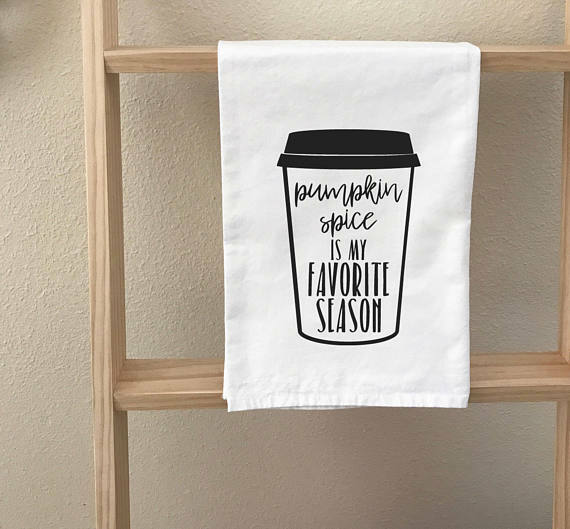 For all you PSL lovers, this Pumpkin Spice Tea Towel by West Market Designs is just the thing. I like how it is black and white. I do love traditional fall colors, but they don't always match with my decor. This modern, minimal one is perfect. There are several different Fall tea towels in the same design, and for just over $10, it's something to get for yourself and one or two more to give as a Fall hostess gift! If however, you do want traditional Fall colors, a wreath or swag is the way to go! 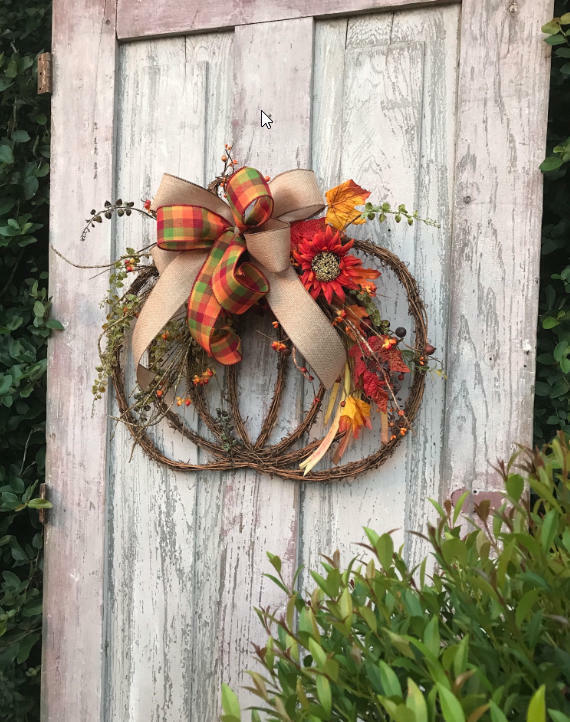 I love this Grapevine Fall Pumpkin Wreath because it could go on a door just like a wreath, or it could be hung up anywhere inside as well. Kelea's Florals has so many festive fall pieces, so be sure to check them out! 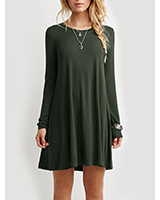 You can see all of their Fall designs here >. 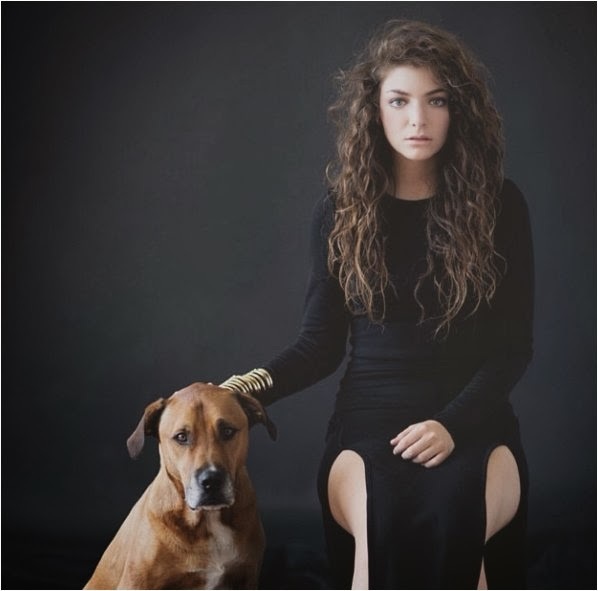 As you might guess, she has some amazing items for Christmas as well! This print also caught my eye for Fall despite it's minimal design. 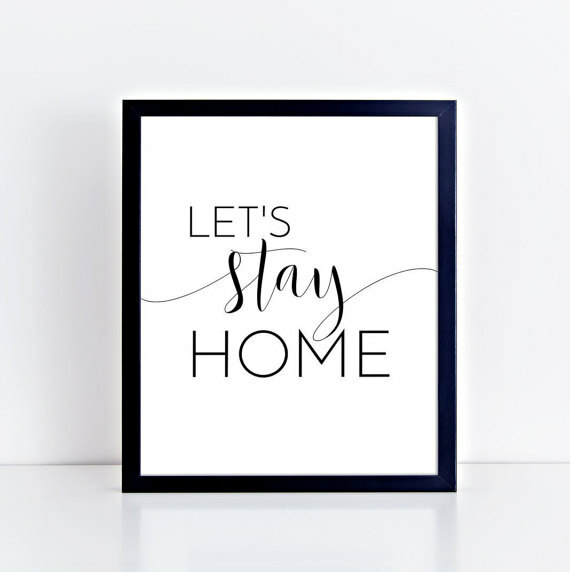 To me one of the best things about fall is a snuggly night in with my love, so a print that says "Let's Stay Home" is perfect for the season. Though of course it's perfect year round as well. I would group this and one of the other prints by Tori Kraut Designs, like this "Our Happy Place" print on a gallery wall of our family photos. :) Which print would you choose and where would you place it? These fun prints are customizable in that they are digital downloads that you can print yourself, so you can frame and hang them any which way you like! Okay, so I'm seeing a bit running theme now, and it is minimal and modern. 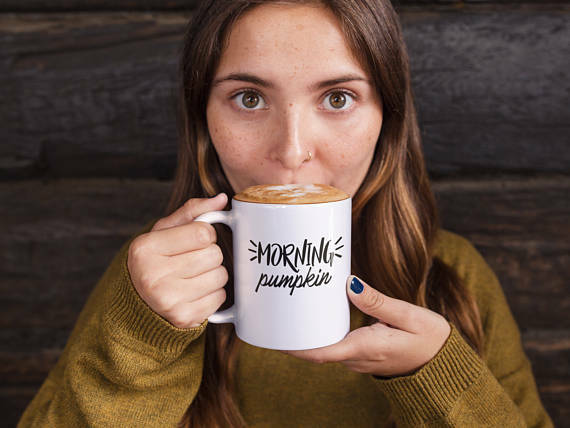 Don't get me wrong, I would love a big bright orange mug in the actual shape and design of a pumpkin, but I also love the cool and simple black-and-white design of this "Morning Pumpkin" Fall Mug by Auggie Lamb. And for next month, they've got some really cool Halloween mugs too! And last but not least, another absolute favorite way to change up seasonal decor is with a throw blanket or a cute throw pillow. 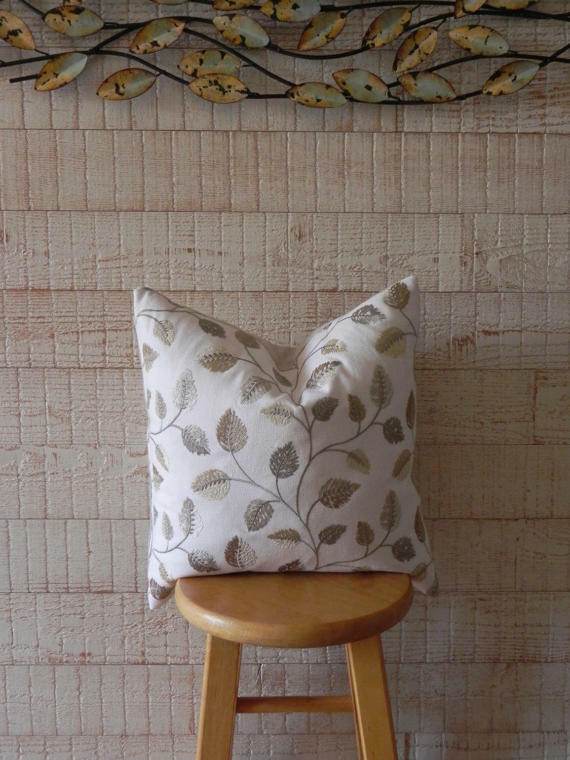 These designs by Own Your Leaf make it very easy, as they are pillow covers. You could start with a plain white pillow and simply swap out the cover each season. That is really the best way if you think about it. Have you ever tried to put a throw pillow in the wash? It comes out all lumpy. This way you can wash the cover without ruining the pillow insert. I love this Leaf Print Pillow Cover for Fall and absolutely love these faux fur pillow covers for winter. Check out this shop over the holiday weekend for 20% off select items! Absolutely stunning finds! Love them all. Thanks for sharing! Love these chic earrings and would love to get this scarf for fall. Thanks for sharing these finds. Me too! Definitely want the scarf and mug...and well everything else too ha. I must admit, I am sad to see Summer end :( However, I do love your Fall inspo selection and I am looking forward to pumpkin spice latte :) The coffee mug is super cute and I am really digging the scarf. Thank you for sharing. Loving your finds! Those earrings look so cool! I am so ready for fall and I love your earrings! I am so with you on the fall train and this is making me even more ready! Nice finds! I love them all! You found the cutest stuff! Love that scarf and the pumpkin mug is adorable! I'm obsessed with those earrings. The colours are so pretty. 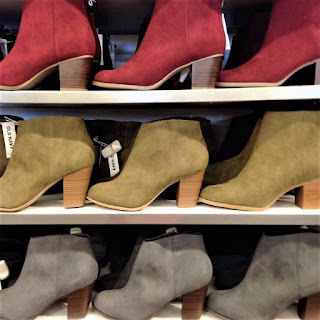 Perfect finds for Fall! Love your finds! Perfect for the season! Perfect finds! Those earrings are stunning babe! Thanks! :) And me too...I definitely want some of those for Fall! Great finds ! Thanks for sharing !